On December 31st, 2005, while many ordinary online businesspeople were out getting snockered, trying to forget what a disaster 2005 was, and praying for a better 2006, Willie Crawford and two consulting clients spent many hours planning how they were going to achieve major success in 2006. Their families approved, because they understood that 2006 was The Year! Both of the consulting clients planned on earning more than $1 million a year for the first time in 2006. Willie carefully explained to them, EXACTLY what that would take. Now you can share in this incredible insight too. Willie Crawford, one of the most successful, and most sought-after online marketing mentors today, took copious notes during this intimate planning session. These clients had come to Willie because he is a trusted role-model for the 30,000+ member, Internet Marketing Warrior’s ... Moderating their member-only discussion forum. Willie later sanitized his notes (to protect his clients identities and projects), and turned them into a Master Blueprint that any serious online marketer hungry enough for success to actually get into action can use to make 2006 YOUR Year! "The Master Blueprint To Internet Marketing Success"
Willie not only tells you what you needs to do, he teaches by providing lots of concrete examples... Examples from his own marketing, and examples from his many "millionaire marketing mentors." Even the structure of the special report is a teaching tool that is thoroughly explained to you. Just employing the “BB” technique explained on pages 3 and 4 has, and will continue to, automatically build massive businesses for many people. In this special report you'll discover the Millionaire Mindset and results-generating habits of those actually "Living The Dream!" Effortlessly and habitually earn the maximum amount on all of your products. 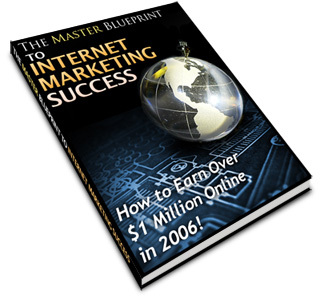 Read The Master Blueprint To Internet Marketing Success to discover this and a lot more. Rich people don’t have time for that. In-fact, with most documents that they read, they want to read only an “Executive Summary! “ In many ways this special report is an executive summary… 9 years of online experience, plus the teachings of dozens of advisors and direct marketers, condensed down to 23 pages. The honesty in this special report is... at times... BRUTAL... because I tell you the truth rather than what you’d rather hear or believe. Most people won’t do that for you because they just want your money. I don’t need your money - I need to feel that I’ve contributed in a positive way to helping YOU building a better, more secure life for yourself and your family. By now, you should realize that you NEED this special report. You realize that if it can honestly turn your business life around, it's easily worth thousands of dollars. One concept that you need to master early-on is that if something can make you $100,000 more per year, then you should gladly be willing to pay $10,000 or even $20,000 for it. You'd still come out $80,000 - $90,000 ahead. Many people don't seem to recognize this, yet all of the ultra-rich do. That's one thing that separates them from the masses. However, I'm not going to charge you tens of thousands of dollars for this special report. I do KNOW that if you apply what it teaches, you will believe that it's worth that much though. In-fact, I would be surprised if, after reading and applying this special report, you walked up to me one day and handed me a check for $10,000 as a thank you gift... but hold off on that for now. For now, I only ask you for a token $29.97. The master resale rights means that you can resell this special report for any amount that you choose and keep all of the money. You may also resell the rights to resell this report and keep all of the money. The master resale rights also allow you to include the special report in your membership sites, use it as a bonus, or package it with other products. It cannot be sold on Ebay or auctions sites, and it CANNOT be modified in any way. I explained all of the points covered in this special report in a teleseminar that I also recorded and had transcribed. You are told inside the special report how to access these recordings FREE. You customers will also be allowed to access these recording for free, but they must access them through our site. These recordings cannot be distributed outside of the special report. Knowing that you would want to discuss concepts, principles, and ideas covered in this special report, I've set up an exclusive blog for further discussion. You will be told how to access this password protected blog from inside the special report. This is where you would go to clarify points, bounce ideas off of like-minded individuals, and even find joint venture or serious business partners. 4) A Duplicate Copy of This Website, to Edit and Use in Selling Copies of the Special Report. You'll get all of the files, plus all of the instructions, need to set up a site IDENTICAL to this one. This will allow you to quickly set up a site and begin raking in the money from reselling this special report package. (Note... you'll also get a professionally designed header graphic that we didn't use on this site because testing indicated the site worked better without the header). If after reading “The Master Blueprint To Internet Marketing Success” you are not 100% delighted with your purchase, just let us know. If you don’t feel that this special report better-equipped you to earn more money online than most people would even DARE to dream of, request a refund. We want you 110% satisfied with your purchase, and if you aren’t, we’ll issue you a 100% no-questions-asked immediate refund… And we’ll still be friends.. Suddenly all these special reports and Ebooks about wealth and making money have become obsolete. Your MasterBluePrint tells it all. Right from the heart of someone who's been there and done that, from zero to a million and more. Your advice in this small report is practical and very down to earth, yet contains tons of human wisdom, so easily visualized by the many examples you've put in. Your conversational tone makes this so darn easy to read, that I couldn't stop. I've just finished reading your 'Master Blueprint To Internet Marketing Success' and I had to write and let you know how impressed and how helpful it is. You've successfully combined clarity and succinctness into this report and effectively broken down the essence of online marketing. Anyone who reads this report can't fail to be enriched by it. This was one of those rare books that I read cover to cover TWICE! Thanks for offering the rights. You are going to make a lot of people very happy in the New Year! BTW, I genuinely thought that your report was brilliant. A great reminder of things that I already knew but didn't know that I knew. As usual you have produced a great piece full of all kinds of information. You are very generous in many ways. Thank you for starting 2006 off in a very positive light. It's Decision Time. Are You Ready To Make 2006 Different And Give Yourself And Your Family A Better Life? The only thing you risk losing is your excuse for not being more successful. You have to decide that 2006 is going to be different. One definition of “insanity” is “doing the same thing over and over, and expecting to get different results each time.” If you don’t do things differently this year, but expect more success, that’s INSANE. Grab this special report to discover the things that you absolutely most do differently. Most people start each year out with big plans. Now you’ll have a proven system for ensuring that you have viable plans. Set aside an hour or two, download this special report, and Change Your Life!